Why Are Bacteria Sometimes Called Nature's Recyclers? You are probably familiar with fungi as mushrooms on pizza or mold on bread. In your kitchen, fungi are just tasty ingredients or a substance that ruins your leftovers. In an ecosystem, fungi play the role of decomposers -- they break down dead organic matter and return vital nutrients to the soil. Without fungi, nutrients would not cycle through an ecosystem, causing the breakdown of the entire food chain. The food chain begins with primary producers, such as green plants, that get energy from the sun and convert it to food through photosynthesis. Primary consumers, or herbivores, eat plants, secondary consumers eat primary consumers, and even tertiary or quaternary consumers enter the food chain. At the end of the chain, fungi and other decomposers take care of the “waste” in the food chain by consuming dead plants or animals. Decomposers complete the food chain cycle, and when nutrients return to the soil, a new food chain begins. While most fungi look like plants, they do not have chlorophyll and cannot make their own food through photosynthesis. Types of fungi range from mushrooms to toadstools or mold to mildew, and they can even form symbiotic relationships, such as lichens, which are the combination of fungi and algae or cyanobacteria. Fungi reproduce by making spores, which are spread by water, wind and even animals. In food chains, fungi act as decomposers, also called saprotrophs, which recycle nutrients in an ecosystem. Without fungi, forest floors would be covered in plant debris and animal carcasses; similarly other ecosystems would have a vast amount of waste piled up. Fungi break down plant components like lignin and cellulose, so they are particularly important in woody ecosystems. They also break down surface waste and release nitrogen back into the soil in the form of ammonium nitrate, a nutrient that plants need for survival. Without fungi, nutrients in the soil would be used up, and plants would not have food and couldn’t survive. If plants don’t survive, the animals that depend on plants for food would also suffer, and the whole food chain would collapse. Since transferring nutrients from fungi to the soil is such an integral part of the food chain, some organisms team up with fungi to form symbiotic relationships. Mycorrhiza, for example, is a symbiotic relationship in which fungi live in plant roots; the plant provides the fungi with carbohydrates, and the fungi in return transfer nutrients like phosphorus to the plant. 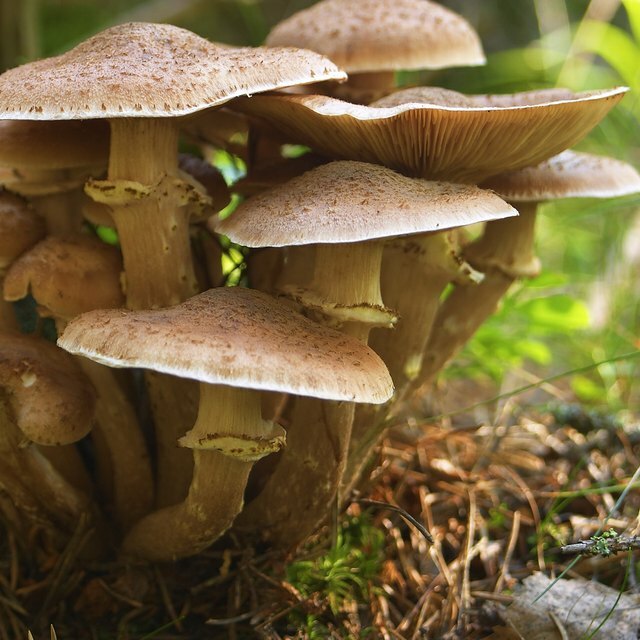 While most fungi aid the function of the ecosystem and contribute positively to the food chain, some fungi are harmful and destroy crops or other plant life. Fungi can spread on tree bark, for example, and decay the plant material; as large areas of dead tissue spread on the tree, nutrient supply is cut off, and the tree dies. Still other fungi produce toxins that are deadly to animals, including humans. What Are Three Types of Producers Found in the Tropical Rain Forest? Batema, Cara. "What Role Do Fungi Play in Food Chains?" Sciencing, https://sciencing.com/role-fungi-play-food-chains-13253.html. 13 March 2018.